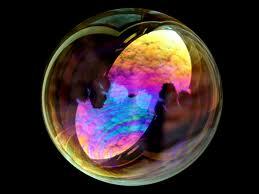 This article is about the protective shield worn on the finger or thumb. For the wire rope termination device, see Wire rope#Thimbles. A thimble is a small hard pitted cup worn for protection on the finger that pushes the needle in sewing. Usually, thimbles with a closed top are used by dressmakers but special thimbles with an opening at the end are used by tailors as this allows them to manipulate the cloth more easily. Finger guards differ from tailors’ thimbles in that they often have a top but are open on one side. Some finger guards are little more that a finger shield attached to a ring to maintain the guard in place. The Old English word þȳmel, the ancestor of thimble, is derived from Old English þūma, the ancestor of our word thumb. A single steel needle from the time of the Han Dynasty ancient China (206BC – 202AD) was found in a tomb in Jiangling, and it must be assumed[why?] that thimbles were in use at this time also although no thimble seems to have been discovered with the needle. The earliest known thimble — in the form of a simple ring — dates back to the Han Dynasty ancient China also and was discovered during the Cultural Revolution of the People’s Republic of China (PRC) in a lesser dignitary’s tomb. Oddly, neither the Romans nor the Greeks before them appear to have used metal thimbles. It may be that leather or cloth finger guards proved sufficiently robust for their purposes. There are so-called Roman thimbles in museum collections, but the provenance of these metal thimbles is, in fact, not certain, and many have been removed from display. 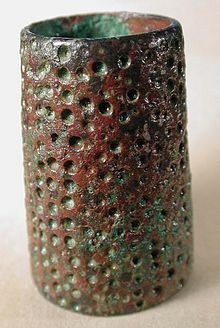 No well-documented archeological data link metal thimbles to any Roman site. According to the United Kingdom Detector Finds Database, thimbles dating to the 10th century have been found in England, and thimbles were in widespread use there by the 14th century. Although there are isolated examples of thimbles made of precious metals—Elizabeth I is said to have given one of her ladies-in-waiting a thimble set with precious stones—the vast majority of metal thimbles were made of brass. Medieval thimbles were either cast brass or made from hammered sheet. 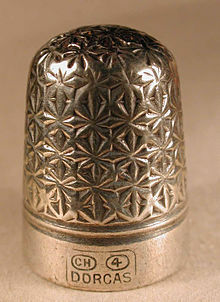 Deep drawn Nürnberg thimble. 16c. 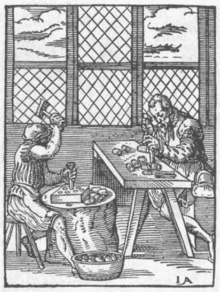 Early centers of thimble production were those places known for brass-working, starting with Nuremberg in the 15th century, and moving to Holland by the 17th. 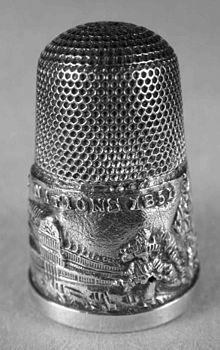 In 1693, a Dutch thimble manufacturer named John Lofting established a thimble manufactory in Islington, in London, England, expanding British thimble production to new heights. He later moved his mill to Buckinghamshire to take advantage of water-powered production, resulting in a capacity to produce more than two million thimbles per year. By the end of the 18th century, thimble making had moved to Birmingham, and shifted to the “deep drawing” method of manufacture, which alternated hammering of sheet metals with annealing, and produced a thinner-skinned thimble with a taller shape. At the same time, cheaper sources of silver from the Americas made silver thimbles a popular item for the first time. Thimbles are usually made from metal, leather, rubber, and wood, and even glass or china. 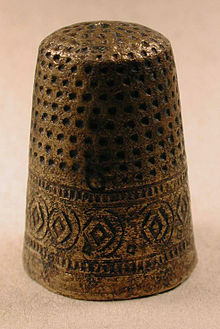 Early thimbles were sometimes made from whale bone, horn, or ivory. Natural sources were also utilized such as Connemara marble, bog oak, or mother of pearl. Rarer works from thimble makers utilized diamonds, sapphires, or rubies. Advanced thimblemakers enhanced thimbles with semi-precious stones to adorn the apex or along the outer rim. Cabochon adornments are sometimes made of cinnabar, agate,moonstone, or amber. Thimble artists would also utilize enameling, or the Guillochétechniques advanced by Peter Carl Fabergé. Originally, thimbles were used simply solely for pushing a needle through fabric or leather as it was being sewn. Since then, however, they have gained many other uses. From the 16th century onwards silver thimbles were regarded as an ideal gift for ladies. Early Meissen porcelain and elaborate, decorated gold thimbles were also given as ‘keepsakes’ and were usually quite unsuitable for sewing. This tradition has continued to the present day. In the 19th century thimbles were used to measure spirits, which brought rise to the phrase “just a thimbleful”. Prostitutes used them in the practice of thimble-knocking where they would tap on a window to announce their presence. Thimble-knocking also refers to the practice of Victorian schoolmistresses who would tap on the heads of unruly pupils with dames thimbles. Before the 18th century the small dimples on the outside of a thimble were made by hand punching, but in the middle of that century, a machine was invented to do the job. If one finds a thimble with an irregular pattern of dimples, it was likely made before the 1850s. 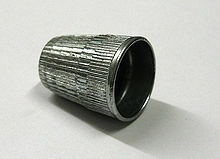 Another consequence of the mechanization of thimble production is that the shape and the thickness of the metal changed. 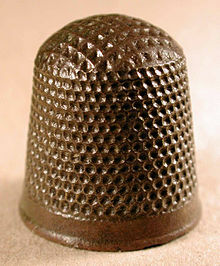 Early thimbles tend to be quite thick and to have a pronounced dome on the top. The metal on later ones is thinner and the top is flatter. Collecting thimbles became popular in the UK when many companies made special thimbles to commemorate the Great Exhibition held in the Crystal Palace in Hyde Park, London. In the 19th century, many thimbles were made from silver; however, it was found that silver is too soft a metal and can be easily punctured by most needles. Charles Horner solved the problem by creating thimbles consisting of a steel core covered inside and out by silver, so that they retained their aesthetics but were now more practical and durable. He called his thimble the Dorcas, and these are now popular with collectors. There is a small display of his work in Bankfield Museum, Halifax, England. Early American thimbles made of whale bone or tooth featuring miniature scrimshaw designs are considered valuable collectibles. Such rare thimbles are prominently featured in a number of New England Whaling Museums. During the First World War, silver thimbles were collected from “those who had nothing to give” by the British government and melted down to buy hospital equipment. In the 1930s and 40s glass-topped thimbles were used for advertising. Leaving a sandalwood thimble in a fabric store was a common practice for keeping moths away. 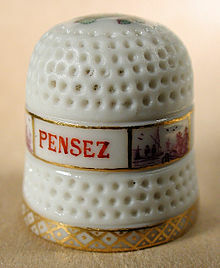 Thimbles have also been used as love-tokens and to commemorate important events. People who collect thimbles are known as digitabulists. One superstition about thimbles says that if you have three thimbles given to you, you will never be married.